Along with "back to school" comes the beginning of birthday party invite handouts (insert mixed feelings). If you're like me, you're swooping through the card section at the toy store to get an expensive card for the birthday boy or girl...only to have them tear through it and trash it anyway! This got me thinking: if we made a nice little stack of homemade notes to stick on gift sacks throughout the year, it would be a good thing for everyone. I love how these gift cards turned out! Oliver of course is super keen to parade his talents (ahem, first born) and is happy to make his mark on gifts for his friends. 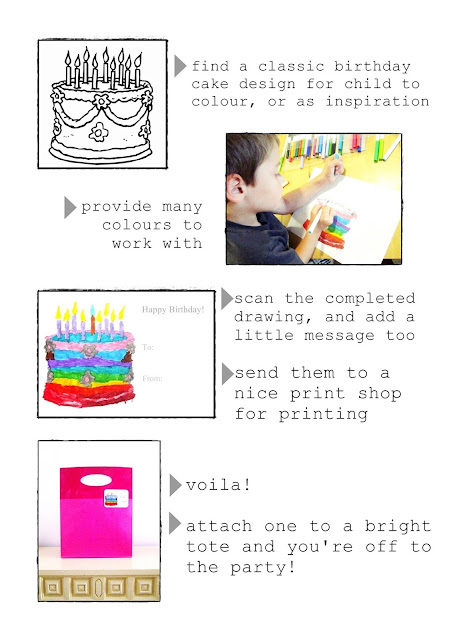 Any birthday party burnout tips out there I should know about? Survival guide? Awsome! As far as birthday survival I think you are doing great! I will sit down Baby A to make these for the new "school year" She will be busy giong to little birthday parties all winter! Thanx! I like the bright colours of the tote and the colourful cake. Handmade is so good to give and receive. Such a cute idea and thoughtful too! That's so clever! We don't always put cards with gifts anyway, but it's mainly because I have trouble finding ones I like at the store. I'm remembering this for when we have a kid! That's a great idea! And the fact that Oliver colored the card makes it even more special!